Melkior Resources White Lake Project is comprised of 328 contiguous claim units (12,966 acres), located approximately 15 km northeast of the Hemlo Gold Mine currently operated by Barrick Gold Corporation. The White Lake Property is situated in the north-eastern portion of the Hemlo Greenstone belt, which has only seen sporadic interest in the last four decades, since the Hemlo staking rush. The White Lake Property has only been partially covered by airborne EM surveys (Aerodat Limited, 1989) and subject to multiple Magnetometer, VLF, IP, Spectral IP surveys, geological mapping and soil sampling. Limited trenching, blasting and diamond drilling has been undertaken only on the Kakeeway claim group. This surface work resulted in in the discovery of the high-grade Carroll-MacDougall gold occurrence in the fall of 1993. 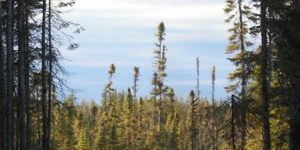 The Carroll-MacDougall gold occurrence has reported assays of up to 1,168 g/t gold, taken by Resident Geologists with the Ontario Geological Survey. In June 2017 Melkior made a site visit to the Carroll-MacDougall gold occurrence, samples were taken and confirmed its gold bearing nature with values up to 19.2 g/t gold. The structure hosting the Carroll-MacDougall gold occurrence is parallel to and within one meter of a transition from mafic to felsic volcanic rock. This contact zone has been reported to be auriferous over about 100 meters. Melkiors claim units cover the southeastern extension of the North Limb of the Hemlo Greenstone Belt to the limit of a Provincial Alienation. A geological compilation map (Map 2614, Muir, T.L. 2000) indicates the greenstone belt strikes NW-SE and that a gold occurrence is present on Melkiors claim group close to the southern boundary. Further to the NW of this gold occurrence are two molybdenum occurrences. In the Hemlo Area there is a strong positive correlation between molybdenum and gold mineralization. The map also indicates a group of gold molybdenum occurrences on strike and within the greenstone belt about 500m south within the alienation. 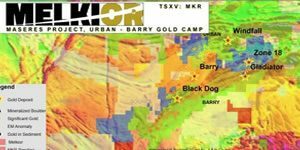 The linear trend of gold and molybdenum showings in the southeastern portion of the claim group and along strike of the Kakeeway Claims reinforces Melkiors belief that the area merits additional exploration. Historical exploration data, available through the MNDN, has been amalgamated and reviewed. 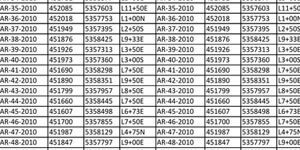 At least five soil sampling surveys have been conducted over parts of the current claim group. There appears to be some consistent anomalous gold trends that persist and are co-located with VLF trends and IP chargeability trends. The review reinforces the concept that there may be a gold mineralized zone within the Hemlo Greenstone Belt where it traverses Melkiors claim group. Melkior in acquiring the Kakeeway claim group inherited a valid Exploration Permit. 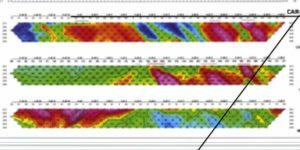 The area of the exploration permit is co-incident with an area where there is a confluence of magnetic, VLF, IP and gold in soil trends. It is this area that will become the focus of Melkiors initial exploration efforts on the White Lake Project. Melkior plans on implementing an A-Horizon soil sampling program before the end of summer 2017 over a section of the claim group, primarily within the area of the exploration permit. Based on the results of the soil sampling program additional work will be conducted with the goal of advancing the White Lake Project to the drill stage.